Arthur Robert Percy Hughes was born on 12 March 1900 at Wycombe, Buckinghamshire (England). As a teenager he moved to Australia, Toowoomba (Queensland), and served with the Australian Infantry Forces in the last years of WWI. He moved to New Zealand in the 1920s. 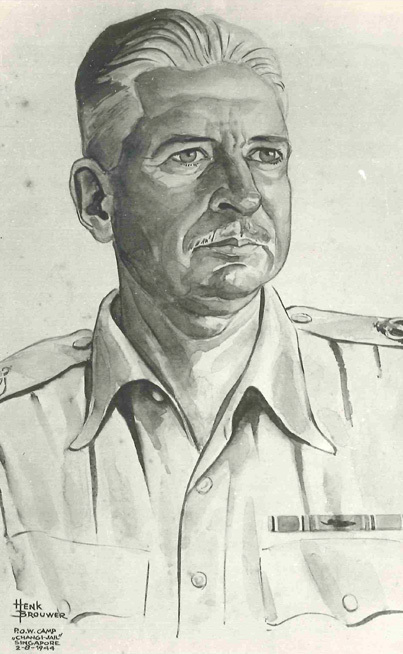 In the 1930s he lived in Ceylon and his subsequent military career included service with the Ceylon Defence Force and Indian and New Zealand armies. During WWII, while imprisoned in Changi, he was responsible for both Australian and New Zealand prisoners of war. After WWII he returned to New Zealand and farmed at Swanson, near Auckland. He rarely spoke about his many harrowing experiences while imprisoned. Hughes accomplished several public positions: Mayor at Waitemata County Council, President of the Auckland Institute and Museum, President of the Heraldry Society and Grand Bailiff of the Order of St Lazarus of Jerusalem in New Zealand. Hughes died at Auckland in 1992.